The Ukrainian Catholic Archeparchy of Winnipeg Archives holds rich and diverse records dating from the turn of the twentieth century. Reflecting the growth and development of the Ukrainian Catholic Church in Canada, the materials also reflect settlement where pioneer churches provided community focus in the new land. Mandated to collect, conserve and make accessible the records produced by and about the Archeparchy, the Archives has been an institutional member of the Association for Manitoba Archives since 2003. Housed in Winnipeg's West Kildonan neighbourhood at 233 Scotia St, the Archeparchy of Winnipeg is the seat of the current and third Archbishop Metropolitan, the Most Rev Lawrence Huculak. The first Canadian Ukrainian Catholic bishop, Blessed Nykyta Budka arrived in Winnipeg in December, 1912, twenty years after the first Ukrainian immigrants were officially documented. One hundred years later, with global internet access, archival research is taking on a whole new meaning. The Ukrainian Catholic Archives strives to make its significant records available to researchers living in Canada and around the world. The Archives has partnered in digital projects with other AMA members, such as the University of Manitoba Archives & Special Collections. 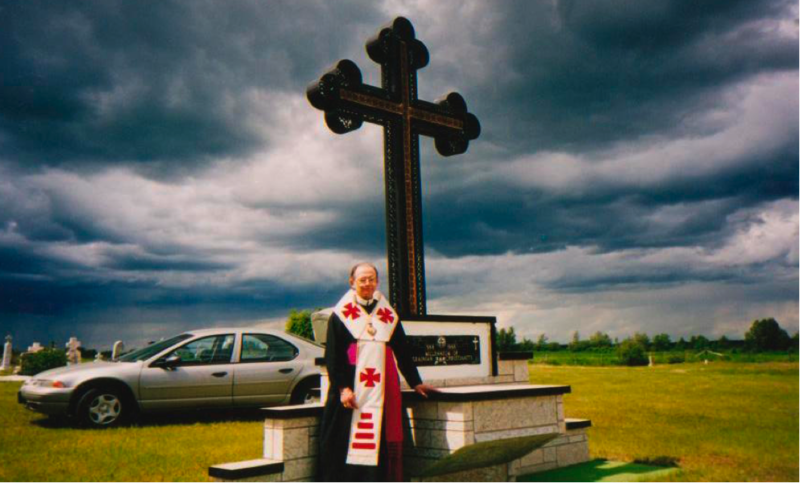 Featured below is a photo from the collection of the second Archbishop Metropolitan, the Most Rev Michael Bzdel, who is seen standing in the cemetery of a rural parish in Lakedale, MB in 2000. Collections featured online include that of Archbishop Metropolitan Maxim Hermaniuk; the Sisters Servants of Mary Immaculate; architect, Rev Philip Ruh; artist, Leo Mol; Rev Jaropolk Radkewycz, among others. Digitization projects have included the scanning of rare books such as the Propam’yatna knyha; the Ukrainian Catholic Churches of Winnipeg Archeparchy; and Smiling Through Tears, to name just a few. With an inquiry or to make an appointment, call 204-338-7801- ext 7; or send an email to uccarchives@gmail.com; or visit the Ukrainian Catholic website at archeparchy.ca. The University of Winnipeg Archives and Records Centre is home to a diverse collection of documentary heritage recording the history of the University of Winnipeg, the surrounding community (i.e. Winnipeg’s inner core neighbourhoods), as well as aspects of Manitoba history relevant to research at the University of Winnipeg, including social justice and human rights. The University of Winnipeg Archives and Records Centre is home to the archival records of the University of Winnipeg and its founding colleges, namely Manitoba College, Wesley College, and United College. We are acquiring a growing number of records and manuscripts of individuals, families, and organizations to meet our broader collection mandate, including the records of former University of Winnipeg President Lloyd Axworthy, the Congress of Black Women of Manitoba Inc., and a collection of material pertaining to the Indigenous Two-Spirit community in Manitoba. In addition, the Archives features an extensive rare book collection and houses the Western Canada Pictorial Index, a collection of over 70,000 images related to the history of Western Canada, gathered over nearly three decades. The Archives has a limited amount of digital material available online including the University of Winnipeg yearbook Vox/Vox Wesleyana, the West Central Streets newspaper, and the Urban Aboriginal Peoples Study videos and raw data. The Archives is located on the 5th floor of Centennial Hall in the heart of the University of Winnipeg campus. Patrons can gain access to the Archives through the 4th floor entrance of the Library. We are open Monday-Friday, 8:30-4:30. Although drop-ins are welcome, we recommend making an appointment in advance to ensure a staff person is prepared to assist you with your research and make your visit as productive as possible. For more information about the Archives and its collections, please visit our website at http://archives.uwinnipeg.ca. We also maintain a vibrant social media presence so be sure to follow us on Facebook and Twitter for all the latest information on our collections, upcoming events, and digital projects.